Plastic waste is a growing concern in Britain and around the world. 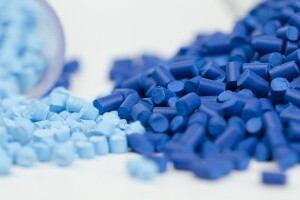 Global demand for plastics is expected to double in the next 20 years, but most plastic packaging is only used once before it is discarded and only about 14% of plastic packaging is collected for recycling. 40% of the globe’s plastic winds up in landfill and about a third of it leaks out into delicate ecosystems. It is estimated that a dumper truck full of plastic enters the world’s oceans every minute. Governments, industry and consumers are starting to wake up to their responsibilities over plastic waste. New legislation has been introduced, companies like supermarkets are rethinking their plastic policies and more and more consumers are voting with their feet for greener companies. Businesses in the food and drink service sector are responsible for a significant proportion of plastic packaging waste. Restaurants, bars, takeaways and coffee shops waste millions of tons of containers, straws and plastic water bottles every year. Here are three things that your food service company can do to limit the amount of plastic it wastes. When thinking about how we reduce plastic waste, most people think about recycling. It is better, however, if we can find ways to never produce the plastic in the first place. Purchasing products and packaging that can be re-used is one of the best ways of achieving this. Single use plastic containers that are thin and liable to snapping are a real blight on the environment. Businesses are often not comfortable using these more than once, especially if they are low quality plastics and are liable to ‘leeching’ into food products. Professional kitchens and other food businesses should purchase food-grade plastic containers that are manufactured with more raw material, are more durable and less prone to cracking. 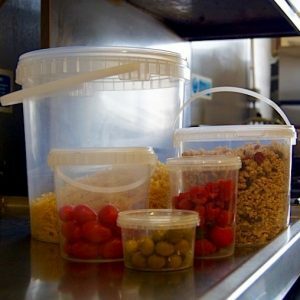 Takeaways that send food out in plastic containers can do their bit by using higher quality containers. Not only do these make your takeaway look more professional, but they are also more likely to be re-used by customers, minimising immediate impact on landfill. Why not try swapping your thin plastic containers for these sturdy round plastic containers. Fast food establishments, restaurants and bars are all guilty of offering plastic drinking straws when they are not necessary. In America alone, an estimated 500 million plastic straws are used and discarded every day. Straws are a particular environmental hazard if they end up in sensitive ecosystems. Partially broken-down straws can end up lodged in nostrils of sea turtles or fill up the stomach of a penguin. Several pub and bar groups have made headlines by announcing plans to phase out drinking straws – either by training staff to not offer straws as standard, replacing plastic straws with sustainable alternatives or banning straws altogether. Often it isn’t just straws either. Coffee shops can reduce their environmental impact by tackling coffee cups, lids and stirrers – either by encouraging customers to bring a reusable cup or by offering recyclable alternatives. It is important that you find out how much waste your food service business produces. Try conducting a waste audit to figure out how much plastic, food and other materials you throw out each year and think about ways that you can tackle this. Remember, as well as saving the planet, you can also save cash on waste disposal services and the cost of buying products like straws in the first place. One of the biggest plastic waste culprits is the single use water bottle. In the UK we use over 35 million plastic bottles every year. Plastic water bottles are rarely re-used, but research suggests that 7 in 10 Brits feel embarrassed about asking for tap water when we aren’t asking for something else. Food and drink service companies can help combat single-use plastic bottles by actively promoting tap water, encouraging people to bring their own reusable bottles of water into your business and/or refilling water bottles on request. ← How can I tell if a bucket is food grade?